Some suspected kidnappers arrested along Suleja-Lambata-Minna, Niger State, were yesterday paraded in Gawu-Babangiga. The suspects were arrested with loads of valuable items stolen from their victims. 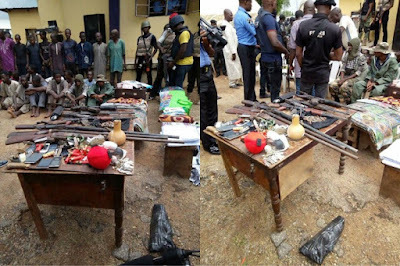 Some locally made guns, charms, camouflage and other items were found in their possession.